A cold, wet, foggy, eerily quiet Christmas day. Wooohooo, despite almost giving up many times this year I have reached 10,000 kms (I keep stats in a separate log book, but if anyone notices an addition mistake please humour me). As a Christmas present to myself, I decided today was the day. Doreen met me on my return and surprsied me with a trophy presentation. 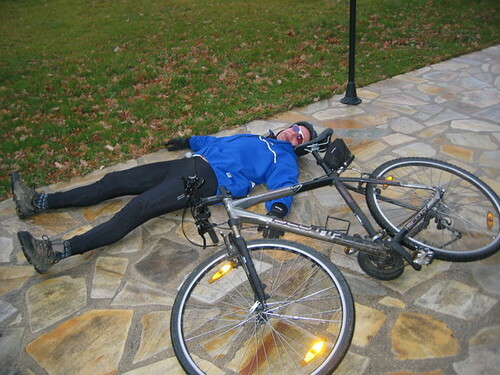 A bronze cyclist with the caption “Super chilly. 10,000 kms en 2005 – chapeau.” Chapeau (meaning hat) is french slang for “well done” — like I take my hat off to you. What a nice (and amusing) surprise. I must thank Doreen for supporting me on this challenge. After taking a ski vacation in January and long weekends to Madrid and Manchester (both to see soccer matches) in February, we never again in 2005 did anything without bringing my bike. She successfully trained and ran the Geneva marathon this year as well as accompanying me on many rides and climbs including climbing herself some giants like Alpe d’Huez. She’s been busy rereading the whole year of blog. It’s amazing how motivational this blog has been in terms of getting me on the road. Even if it is rarely read by anyone but Doreen and I, it was sort of any open declaration to the world. I am pleased, relieved, and tired. And officially retiring from cycling (at least for a few weeks). NEXT YEAR? We are planning on doing a lot more hiking, snowshoeing, and ski-ing than in 2005, but I will have a cycling challenge. It will be unveiled to the world (ok to me and Doreen) in a few days and will include less days cycling but more climbing (on a bike). I have really enjoyed climbing some of the famous mountains in the French Alps and have a long list of climbs that I want to do again, and many more that I would like to do for the first time. I have two great, huge coffee table books with Tour de France pictures focusing on the mountain climbs that are fascinating to read and provide me with (almost) endless challenges. My original challenge also mentioned 100,000 metres of vertical climb. While I only have good altitude data (from my GPS) on about 75% of rides, I estimate I did about 125,000 metres of vertical climb. The biggest was climbing the legendary Galibier from the very bottom – 2,400 metres or about 7,800 feet — on October 15th. The flattest — not sure but with the exception of the Annecy bike path there really aren’t any flat routes here.